Is Your Medical Practice Website ADA Compliant? 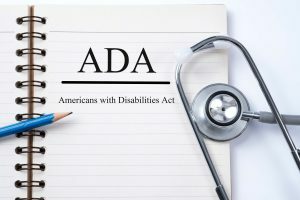 You should be well aware that your office needs to be accessible to people with disabilities, as determined by the Americans with Disability Act (ADA). What most people do not realize is that the ADA also covers virtual extensions of your business, such as your website. Over the past few years, there has been an increase in the number of lawsuits related to website accessibility. Much of this stemmed from an ADA compliance case against Winn-Dixie where their website was found to not be ADA compliant. In this case, the company was obligated to set aside $250,000 to update their website and was also responsible for the plaintiff’s legal fees. In the medical world, this is affecting everyone from urgent care practices to dentists. To be clear, independent of the legal issue, creating accessible websites is the right thing to do. A disability should not stop someone from having access to healthcare practices. In addition to being the right thing, creating accessible websites is also the more profitable thing to do. Millions of Americans have disabilities that limit the websites they can use. If your site is accessible, you open yourself up to these potential patients. Please give this letter your immediate attention. This law firm has been retained to prosecute a lawsuit against you on behalf of our client (“Claimant”) who is a blind individual who attempted to access your website in order to find out information regarding the services your business provides. The United States Department of Justice (“DOJ”) and various courts throughout the country have determined that businesses which offer goods and services to the public through websites are public accommodations that must comply with the general accessibility mandate of the Americans with Disabilities Act (“ADA”). The international website standards organization – the World Wide Web Consortium (“W3C”) has published version 2.0 of the Web Contact Accessibility Guidelines (“Guidelines”). The Guidelines are widely recognized as setting the baseline requirements for website accessibility and have been used by the DOJ as a benchmark in assessing website accessibility. Claimant reported to us that your website has access barriers. Claimant’s report has been confirmed by our consulting expert, who found the following barriers, including but not limited to noncompliance with WCAG 2.0 guidelines 1.1.1; 1.3.1; 1.4.1; and 2.1.2. We propose the parties engage in pre-litigation negotiations, with the goal of achieving an enforceable agreement providing for injunctive relief, statutory damages, and reasonable attorney’s fees and costs. We would like to work constructively with you, on behalf of our client and others similarly situated, to achieve accessibility for all blind individuals who visit your website. Your company will implement other related policy, technology and programming, monitoring, and training measures as they are identified and needed. My client has instructed me to file a class action lawsuit within twenty-one (21) days of today’s date if this matter is not resolved. See, e.g., Gil vs. Winn-Dixie Stores, Inc., Statement of Interest of the United States, Case No. 16-CV-23020-RNS (S.D. Fla.) (“Consistent with the text and legislative history of the ADA, the Department of Justice (Department) has long affirmed the application of the Title III of the ADA to websites of public accommodations.”); Statement of Interest of the United States, Nat’l Assoc. of the Deaf v Netflix Inc., 869 F.Supp.2d 196 (D Mass 2012) (discussing history of public DOJ pronouncements on the topic); National Federation of the Blind v. Target Corporation, 452 F.Supp.2d 946 (N.D Cal.2006) (denying motion to dismiss).There is little doubt that the Title III accessibility requirements apply to websites. So, how can you avoid this situation? Work with a developer that understands ADA compliance to create (or retrofit) your site. The developer should have training in ADA issues and have access to a set of tools to help them write compliant code. Perform an audit of the website code to find possible oversights. The auditor and developer should then work together to fix issues, before performing a final audit and then approving the site. The manual audit should be focused on the various templates used for pages within the site. Once those templates are approved and appropriate guidelines set in place, provide ADA compliance training to all people who edit the site in any way. Use automated tools to check all new and edited pages. Add a compliance statement to the site, including a way for disabled individuals to contact you if they experience any issues with the site. What should you do if you get a letter like the one above? Don’t panic, but act quickly to begin making your site ADA compliant. You’ll want to follow the same process as you would to avoid the issue, but since you haven’t avoided it, every day counts. Many auditors will provide a statement you can immediately apply to your site, describing their relationship with you. This has been shown to minimize the risk of lawsuits proceeding. All that said, as a reminder, I am not an attorney. I highly suggest that all medical practice owners discuss this issue with your legal advisors and insurance agents. If, based on their advice, you need help making your site accessible, we are available to help.